When a user asks a question in Google Search, they might show a search result in a special featured snippet block at the top of the search results page. This featured snippet block includes a summary of the answer, extracted from a webpage, plus a link to the page, the page title and URL. How can you get your snippet to show up? Are you the person that edits your website hosted by completewebpages? 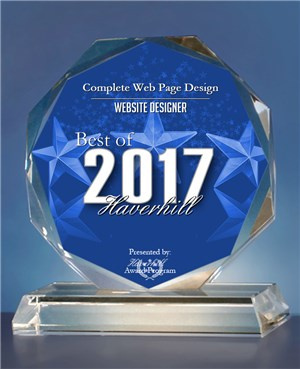 HAVERHILL November 9, 2017 -- Complete Web Page Design has been selected for the 2017 Best of Haverhill Award in the Website Designer category by the Haverhill Award Program. Each year, the Haverhill Award Program identifies companies that we believe have achieved exceptional marketing success in their local community and business category. These are local companies that enhance the positive image of small business through service to their customers and our community. These exceptional companies help make the Haverhill area a great place to live, work and play. This submittal fee does not include optimizing your existing website. Gives you 6 months/once a month submittal to the major search engines. Bad News! Google is no longer offering it to our clients. PayPal is offering Website Dynamics clients an exclusive deal pertaining to PayPal Payments Pro. If you upgrade to PayPal Payments Pro, you can have the normal $30 monthly fee WAIVED. Once you have your first transaction go through, the monthly fee would then be waived. There is no cost for upgrading, and your transaction fees would remain the same. If you are already a Payments Pro customer, simply process a transaction through your shopping cart and your monthly fee will be automatically waived. If you are a client of Complete Web Page Design and host through www.completewebpages.com then you should be thinking about becoming mobile friendly. Here at Complete Web Pages we offer FREE mobile website hosting for our clients. There is a small set up fee to go through each page and bring the content up to mobile standards. As you know Google is penalizing those who are not mobile friendly. Now is the time to get on board and bring your website up to todays standards. Give us a call 978-346-8397 or send me an email at: sandra.kelting@verizon.net to get a FREE quote on bringing your classic site up to standards and be come mobile friendly. As you start to redesign your website to become mobile friendly here is a tool that will help. I think the best thing to do is Hide all pages but the home page. Do all your edits and then check to see if the site is mobile friendly. Then unhide the next page and work on it. I think doing one page at a time will keep you on track and is the easiest way to get it done. Our host has added a new feature - Mobile-friendly. 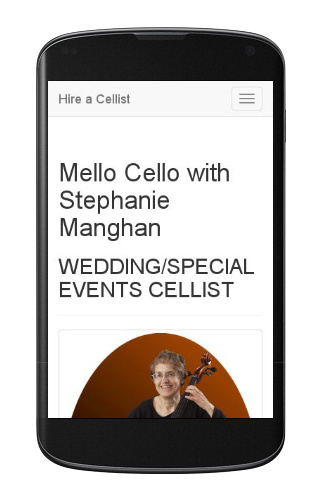 Check out this link for help to customize your pages for the new mobile look and feel. Things have changed. Is your website mobile-friendly?